The Cape winelands offer award-winning bouquets, rich history and spectacular mountain scenery. The Cape winelands form part of a region 40 minutes from South Africa's Mother City of Cape Town. The area, divided into six main wine regions, is the largest wine-producing region in South Africa. Each stretch offers its own unique wine route. Our Cape winelands vacations either focus specifically on the Cape or complement a wider range of destinations in a comprehensive South African vacation. Historic towns, old wine estates and wine tasting second to none. Allow our team to propose a winelands package based on your requirements. The Franschhoek Wine Route is characterized by an inherent French flair. The town itself is rich with Huguenot history and it is South Africa's unofficial food and wine capital. Be sure to visit one of the award-winning restaurants in this charming town. The Paarl Wine Route is known for the popular Nederburg Wine Estate, the much-loved Fairview Wine and Cheese Farm and the KWV Wine Emporium, home to the largest wine cellar in South Africa. 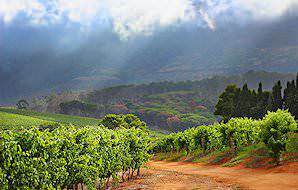 The Stellenbosch Wine Route is South Africa's oldest wine route and surrounds the country's second oldest town. Some of South Africa's finest wines are cultivated in this scenic region. The wine is certainly the most obvious reason to visit the Boland - a reason entirely with merit. With so many fine award-winning bouquets and uniquely South African blends to choose from, even the most discerning connoisseurs will find themselves delighted by the variety and the impeccable quality on offer. South Africa's wine culture is both traditional and dynamic, ensuring a complement for every palate. An established and respected viticulture has fostered an equally revered food culture, which extends from imaginative, fresh, market fare to fine dining restaurants festooned in awards. The Boland is the epicurean capital of South Africa, and you need not venture far from your accommodations to find something mouthwatering and memorable. With their handsome Cape Dutch architecture and bucolic surroundings, the historic hamlets of the Cape winelands hold all the charm of yesteryear. After Cape Town, Stellenbosch is the second oldest settlement in the country, while Franschhoek's Huguenot legacy has been indelibly fixed in the town's tidy little streets, elegant structures and romantic atmosphere. A great deal of the allure of the winelands is owed to the spectacular natural setting. Not only are the towns and the vineyards wonderfully picturesque in themselves, they are augmented by a backdrop of dramatic mountain scenery. The avid outdoorsman may also indulge in hiking or horse riding while visiting the Boland. The Cape winelands are easily accessible via Cape Town International Airport, which is around an hour's drive from the various towns in the Cape winelands. 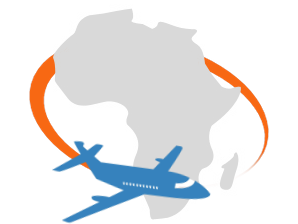 Cape Town International receives flights from all across the world on a daily basis, along with regular domestic flights from Johannesburg and the Kruger Park area. From Cape Town, the winelands towns are between 40 minutes and an hour's drive from the city. If traveling from the Garden Route, the trip is typically between four and five hours, depending on whether you opt for Route 62 through the Little Karoo or the N2 highway through the pastoral Overberg. As your activities will largely be centered around tasting and dining, the Cape winelands is a year-round destination. Like Cape Town, the region sports a Mediterranean climate with dry, sunny summers (October to March) where average temperatures are warm to hot. In some regions, it can reach 40°C (104°F). While you can still enjoy delectable tastings, the peak of summer (January and February) can be stifling in the winelands if there is no wind. Winters (June to August) can be cool, with average minimum temperatures around 5°C (41°F) and maximums around 17°C (63°F). There are still, however, warm, sunny days throughout this period. Rainfall is frequent, with occasional dustings of snow on higher peaks. Do not let the winter rainfall deter you - the rains are typically light drizzles, almost shrouding the winelands in an ethereal mist which can be quite lovely to behold. The Cape winelands are located in a malaria-free part of South Africa, which means that the only medical considerations you should keep in mind are to ensure that your routine vaccinations are up to date and that you bring along any prescription medication that you might be taking. Crime rates in the Boland are relatively low, and it is actually rather pleasant to walk along the main street of Franschhoek at night, with all the restaurants festively lit up for dinner. Nevertheless, avoid quiet areas after dark, and follow the advice of your guide. Memorable experiences to savor in the Cape winelands extend beyond the flavors in the barrels to the culture that was born from their appreciation - delectable cuisine, dedicated festivals and the captivating history of South Africa's first wine pioneers. Mealtimes in the winelands have an almost religious quality about them. It is not simply about satisfying your hunger - it is an experience in itself, above and beyond perfunctory labels like 'lunch' or 'dinner'. Set aside some time to enjoy these gastronomic discoveries at your leisure - paired, of course, with a fine vintage. The pastoral charms of the winelands mean that the area plays host to an exciting event almost every weekend. From traditional wine festivals to herald new seasons or celebrate particular grapes, to Franschhoek's annual Bastille Day Festival where two proud wine cultures meet, check the calendar before planning your trip. Wandering through Stellenbosch and Franschhoek often feels like finding yourself inside a time capsule. The architecture has been beautifully preserved, and buildings with historical status are protected as monuments. Gain insight into the lives of the early European colonists - the persecuted French Huguenots and the proud Dutch settlers. Your private, air-conditioned vehicle and personal African Sky guide come in real handy during tours of the Cape winelands. Sup at your leisure on South Africa's finest and discover the most arresting vineyards without worrying about how to get from one tasting to the next. 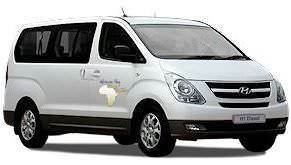 The vehicles we typically use during our tours in the Western Cape are a Toyota Fortuner (for couples or solo travelers) and a Hyundai H1(a spacious alternative for families and small groups). Occasionally, during periods of high demand, we employ the services of a reputable car rental agency. 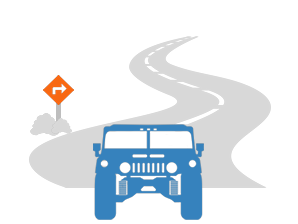 All the vehicles that we make use of are maintained to a high standard and are licensed to carry passengers. Your comfort and safety during your travels are paramount to us. Nothing complements a good glass of wine quite like a good cheese. This delectable culinary tradition has extended to the Boland as well, and some of South Africa's finest cheeses are produced in this region. Many wine farms offer pairings or platters. If your taste buds lean more towards sweet rather than savory, chocolate pairings are increasingly popular. These confections are typically artisanal. Every August, Blaauwklippen Wine Estate hosts the Winelands Chocolate Festival. Between October and December annually, strawberry picking is a popular enterprise in the winelands. The advent of summer means that these succulent scarlet fruits are at their best. Put on a hat, pile up your basket and feast from the source. South Africa's high quality olive oils have started making waves in the international circuit, often beating out heavyweights like Italy, Spain and Greece. The Boland's Mediterranean-like climate provides ideal conditions for groves to flourish. Can I enjoy the Cape winelands if I am not a wine drinker? Yes - the Cape winelands will also appeal to adventurous spirits who enjoy outdoor pursuits like hiking and mountain biking, or leisure seekers who simply wish to relish a good meal and unwind in tranquil surroundings. Depending on your interests, the history of the region is also rather captivating. Can I choose which wine farms I would like to visit? Yes, if you have a particular wine farm in mind. The wine farms visited on the day of your tour are typically determined following a discussion of preferences between you and your guide. Should I make restaurant reservations? Absolutely. Because the winelands are home to some of South Africa's finest restaurants, reservations are highly recommended. We would be happy to assist you in securing bookings. Which town will I be staying in? The guest houses, wine farms and hotels that we use for accommodation are typically either in Franschhoek or Stellenbosch, with a small handful on the edge of Paarl. How far are the winelands from Cape Town? Depending on the town or wine farm you are heading for, the winelands are between 40 minutes and an hour's drive from Cape Town. Can children enjoy the winelands? Yes. A few wine farms offer grape juice tastings so that children can also participate, while others indulge the little ones with chocolate tastings. How many wine farms will I visit? We usually limit the amount of wine farms for a day of tastings to three, to ensure that our guests do not feel rushed and are able to enjoy each farm's unique setting. However, we pride ourselves in our flexibility - should you be keen for more, simply discuss your preferences with your guide. Are there wildlife encounters available nearby? Yes - Spier Wine Farm rehabilitates birds of prey at 'Eagle Encounters', while the Cheetah Outreach in Paardevlei provides visitors with the opportunity to get up close and personal with this majestic endangered big cat. Does South Africa have any unique cultivars? Yes - the Cape blend 'Pinotage' is a unique crossing of Pinot Noir and Cinsaut. Which wine farms are the best? Though any answer would be largely subjective, farms like Kanonkop (Stellenbosch), Boekenhoutskloof (Franschhoek) and Vergelegen (Somerset West / Helderberg) have consistently established themselves as leading wineries. Travel to the 'world in one country' for a variety of unique adventures. Along with South Africa, Botswana is the premier safari destination in Southern Africa. Namibia offers fantastic value for money and unforgettable desert experiences. Travel to Zambia for an alternative safari experience in a remote wilderness area. Zimbabwe's key drawing card is the occurrence of Vic Falls in the Zambezi River. Mozambique's abundance of beaches and islands make it an enticing destination. 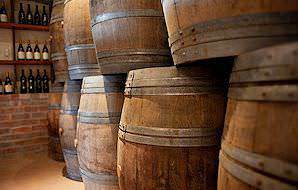 Wine production in South Africa dates back to the very earliest days of European settlement. The first recorded vintage was produced back in 1659 by none other than Jan van Riebeeck, the founder of the Cape Colony. The baton was taken up enthusiastically by his successor Governor Simon van der Stel, who founded the Constantia Estate on the Cape Peninsula in 1685. Constantia soon became known internationally for its "Vin de Constance" a favorite tipple of Jane Austen, Frederick the Great and Napoleon. Wine production spread to the interior of the Western Cape with the arrival of the French Huguenots in the late 17th century. Country towns founded during this period, such as Stellenbosch, Franschhoek and Paarl, remain at the heart of South Africa's wine industry to this day, and the region's historic vineyards - the likes of Boschendal, Vergelegen, Nederberg and Meerlust - are still widely regarded to produce the country's finest wines. 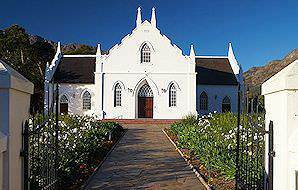 Stellenbosch was founded in 1679 by the Dutch Governor Simon van der Stel. The architectural jewel is the second-oldest town in South Africa, and lies at the heart of the winelands. It is known for its university, the first Afrikaans-language institution of higher education to have been established anywhere in the country, and for having the largest number of Cape Dutch houses of any town in the region. The most harmonious examples are to be found on Dorp, Church and Drostdy streets. Franschhoek (or "French Corner") is named for the the French Huguenots who settled here in the 18th century. The Huguenot Museum and the Huguenot Monument, completed in 1943, recall the history of these Protestant refugees, persecuted by Louis XIV because of their religious beliefs. Blessed with perhaps the most perfect setting of any winelands town, Franschhoek is an ideal place to settle in for an alfresco lunch at one of its many superb restaurants. Paarl (Afrikaans for "pearl") is named for the polished granite domed mountain that rises behind in. Founded in 1720, Paarl feels rather dour and unattractive by Boland standards, but its wine route includes some of the finest vineyards and several first-class restaurants. On the southern slope of the Paarl Mountain you will find the centerpiece of the Afrikaans Taal (Language) Monument, a slender granite needle erected in 1975 to commemorate the centenary of Afrikaans being recognized as an official language. The Kruger National Park is astonishing in its sheer diversity, from the varying ecosystems to the 147 different species of mammals that thrive here. The Sabi Sand Private Game Reserve serves as an exclusive 65 000-hectare extension of the Kruger National Park, with a fine array of luxury lodges. Travel to Cape Town for a captivating city flush with striking natural scenery, world-class restaurants and compelling attractions. The Garden Route comprises a collection of charming coastal towns, rugged beaches, primordial forests and sparkling lakes.